Bloggers Needed for the 2016 FPRA Annual Conference Blog Team! OK, Tampa Bay blogging pros, we need your help! The FPRA Annual Conference is being held in our neck of the woods this year – August 7 to 10 at Innisbrook Golf & Spa Resort in Palm Harbor – and we are looking for people to get more involved. Why not join the FPRA Annual Conference Blog Team! New to blogging? This is a great way to gain experience. Seasoned blogger? Then you know we need you. What’s involved? Simply summarizing the talking points from your assigned session(s). Speaker bios and headshots will be pre-loaded, and your content will be edited and posted for you. What could be easier? 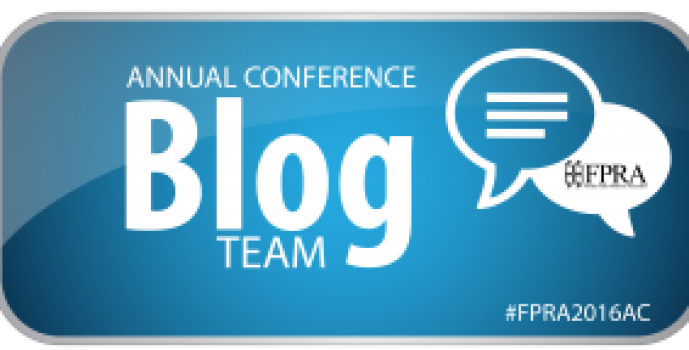 Sign up for the Annual Conference Blog Team. Have questions about the FPRA Annual Conference Blog Team? Contact VP of Technology Devon Chestnut, APR, at devon.chestnut@cox.com. Please note, you must be attending the FPRA Annual Conference to join the blog team. Joining the blog team is voluntary. No Annual Conference discounts or compensation is provided.